A Sea Launch AG rocket launches the Intelsat 19 satellite. PARIS — The Intelsat IS-19 satellite launched May 31 has failed to deploy one of its two solar arrays, Intelsat announced late June 1 – an anomaly that has affected other Space Systems/Loral (SS/L)-built satellites and is likely to have ripple effects on two others preparing for launch in the coming weeks. Luxembourg- and Washington-based Intelsat, in its statement, said only that there was a "delay" in the deployment of one of the arrays. "Intelsat and Space Systems/Loral [SS/L], the manufacturer of the satellite, are investigating the cause and are pursuing corrective actions. The spacecraft is secure at this time in geostationary transfer orbit," the statement said. IS-19 is scheduled to replace Intelsat’s IS-8 at 166 degrees east, where in addition to taking on IS-8 customers it will play a key role in Intelsat's planned global network providing broadband communications to aeronautical and maritime customers. IS-8 has sufficient fuel to continue operating until late 2019, Intelsat said. Palo Alto, Calif.-based SS/L had made no statement on the IS-19 anomaly as of early June 2. EchoStar 17, formerly named Jupiter, a Ka-band consumer broadband satellite owned by Hughes Network Systems of Germantown, Md., has arrived at Europe’s Guiana Space Center in French Guiana, on the northeast coast of South America, in preparation for a launch in late June or early July aboard a European Ariane 5 rocket. 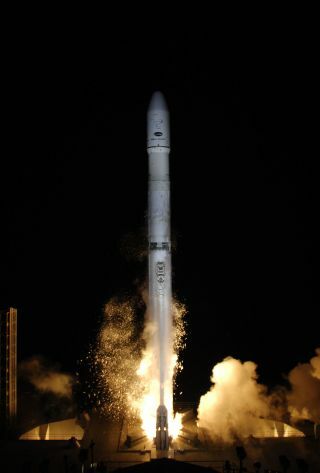 That launch, which will also carry Europe’s MSG-3 meteorological satellite, had been scheduled for mid-June. But in mid-May the decision was made toscrap that date to permit SS/L to perform additional verifications on the spacecraft. SS/L did not say whether the additional verifications had to do with the satellite’s solar array deployment mechanism. Also awaiting launch is the SES-5 telecommunications satellite owned by SES of Luxembourg. SES-5 arrived at Russia’s Baikonur Cosmodrome in Kazakhstan on May 21 in preparation for a June launch aboard an International Launch Services Proton rocket. The SS/L-built Estrela do Sul-2 satellite launched in May 2011 was unable to deploy one of its solar arrays when a small nylon clip that holds the solar-array cabling in place came loose. The freed cabling snagged on a metal clip that holds the array to the satellite’s body in stowed position for launch, preventing deployment of the array. The cabling subsequently snapped under the stress and in so doing broke a piece of the solar array. Estrela do Sul-2’s owner, Telesat, subsequently received $132.7 million insurance claim, saying the satellite would be limited to 60 percent of its expected broadcast capacity because of the solar-array problem, and that its service life would be cut to 12 years from 15 years.